Sorry, there’s just no way to make meat sitting in brine look like a supermodel. But it’s going to taste really good. Corned beef. A staple of St Patrick’s Day here in America, along with green beer and a green river, at least here in Chicago. This year instead of buying the supermarket corned beef I decided to make my own. Armed with a brine recipe from Ruhlman’s Charcuterie I picked up a 4 lb slab of beef brisket (flat cut) and set about getting started. The recipe calls for some pickling spice to be added to the brine and suggests you can use pre-made packets if you don’t want to make your own mixture. I don’t know, kind of defeats the purpose of doing it all yourself, no? And since I’m always looking for an excuse to use that mortar and pestle on the shelf, I picked up the few items I needed and whipped up a batch. The recipe below (also from Charcuterie) makes 1 cup of pickling spice so you can put the extra in a jar and save for other pickling projects. In a large pot (large enough to hold the brisket comfortably) mix all the ingredients (except the brisket). Bring to a simmer on the stove, stirring to make sure the salt and sugar dissolve. Remove from heat. Allow to cool to room temperature then chill in the refrigerator. 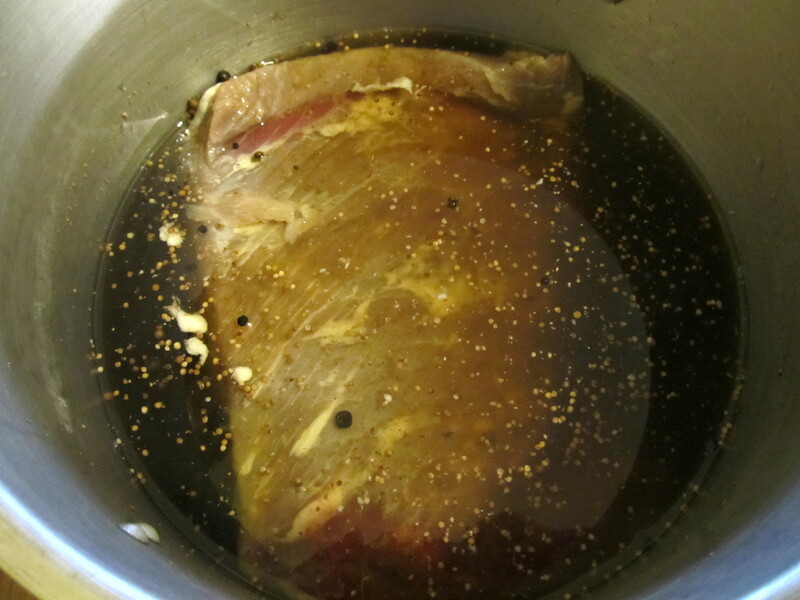 Place brisket in the brine and keep it submerged by placing a heavy plate, dish, etc on top of it. Put in refrigerator and allow to brine for 5 days. Toast the peppercorns, mustard seeds, and coriander on the stove in a small pan. In a mortar and pestle crush the cinnamon sticks and bay leaves. Add the toasted peppercorns, mustard seeds, and coriander and lightly crack them. Don’t pulverize, just crack. Mix all the ingredients together. Store in a glass jar or airtight container of your choice. I must do this. Thanks! I am not sure the water amount is correct. With only a litre the quantity of salt and sugar is too much to dissolve readily. Having checked other recipes I feel 2.5 litres would be closer to the right amount. Your’e right, that should be 1 Gallon or closer to 4 L typo on my part. Thanks for the catch.